Sometimes I just have too many things to hate on. My negative energy is going in all sorts of directions and nothing is getting the full-strength of my evil laser rays. This is where the Bacon Of Hate comes in. All you have to do is write down the object of your loathing on a slip of paper, tuck it into the pocket on the back of your Bacon Of Hate, and it will send focused hate-beams directly to the intended source. You can make as many of these malevolent tools as you need. This idea came to me when a reader misread a blog post of mine and thought I said, "I become a bacon of hate" when I really said, "I become a beacon of hate." I'm not sure which one is better. Wait—everything is better with bacon! 1. Trace the bacon pattern onto your tear-away stabilizer. Some of my readers have successfully used wax paper or tissue paper to trace embroidery patterns. 2. Cut a rectangle piece of pink felt according to the pattern. 3. Pin the traced pattern to the pink felt rectangle. 4. 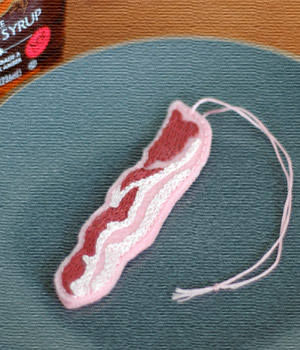 Using the DMC floss #3721, outline the meaty red areas of the bacon pattern. 5. Using the DMC floss #151, outline the light pink areas of the bacon pattern. 6. Gently remove the stabilizer from the felt. The needle may help you pick out small pieces of stabilizer from between stitches. 7. Fill in the meaty red and light pink areas with straight vertical stitches, using the assigned color for each area. 8. Cut another rectangle of felt and the pocket-sized piece of felt. 9. Layer the felt pieces so the back of the bacon stitching is between the two rectangles and the pocket piece is on the outside of the back. 10. Use the DMC floss #819 to stitch around the outside edge of the bacon pattern through all three layers of felt. 11. CAREFULLY trim around the outside edge of the bacon stitching. I like to use manicure scissors for detailed work like this. 12. Attach pink floss to top of bacon as a hanger. Write down the name of your cable company (or your landlord, or your boss, or your nemesis, or... well, you get the picture) and slip it in the pocket. Hang it in a window or other unobstructed area where loathing can easily radiate from your new Bacon Of Hate.